Lucie Parsons, a ten-year old girl from the small village of Walkington, in England, is on a personal mission to save the environment from plastic pollution. After seeing on the BBC Blue Planet II documentary how litter in the ocean is damaging ecosystems, she decided to take action. 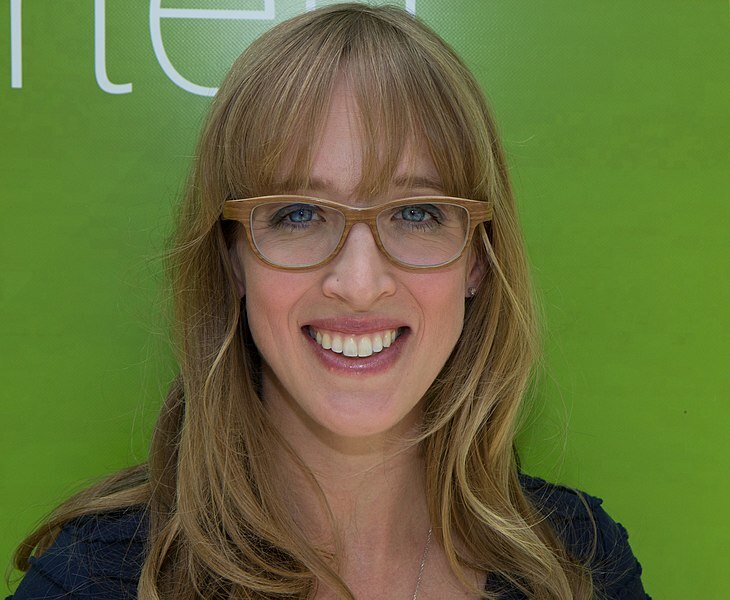 Now she gives talks and is co-researcher in her mother’s PhD on climate change and the youth voice. Lucie has come to the European Geosciences Union General Assembly in Vienna with her mother, Katie Parsons, to tell scientists that children want to be involved in addressing environmental issues. Unless the flow of plastics and industrial pollution into the world’s oceans is reduced, marine life will be poisoned by them for many centuries to come. How did you learn about the impact of plastic pollution in the oceans and marine life? L: Through Blue Planet. I saw an episode about a whale and her calf, and how the contamination poisoned the whale’s milk. When I saw that I got really, really upset so I wrote a poster about it. Then I asked my mummy and daddy to photocopy it so that I might be able to put it around the village. I read and watched documentaries to learn more, and I found out that it is a big problem. I wanted to do something about it. L: Katy Duke, the head of the [aquarium] Deep in Hull, got in touch with daddy because she saw my poster. K: I tweeted Lucie’s poster to show what she had done after she was so moved by the documentary. 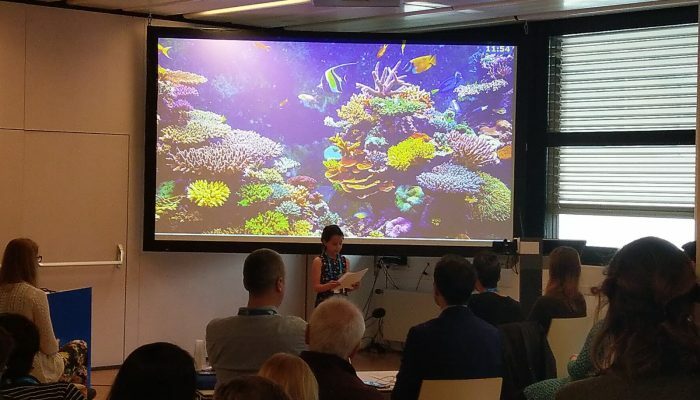 The CEO of the Deep saw that and contacted us to ask if Lucie would like to give the opening talk at the European Union of Aquarium Curators Conference, which the Deep were due to host. What do you tell people in your talks? L: I have done two conferences and talks, also at schools. I have also been interviewed for the radio and profiled by the Earth Day Network. In my talks I basically tell people how bad the problem is, what it is doing to the animals and what they can do to help. Here at the EGU General Assembly people were really touched by your presentation. Do you think your talks make people take action? K: Gilles Doignon, from the European Commission for Environment, was really moved about what Lucie had said at the Deep. He promised her that he would get the aquariums to sign up to a plastic pledge. L: And he managed to do it. K: He said that, thanks to Lucie, thousands of turtles will be saved. This is where she got her inspiration from to carry on. If she can talk and say the things she has done, even if just one or two people do something about it, that creates a knock-on effect. Why do you think children should be involved in the fight against climate change? L: Children are the next generation; when they get older they will take over the work grown-ups have done. So they should start now. Children can do the same things as grown-ups, there is not really a difference with helping, you need to get as many people to help as you can get. K: Getting schools and individual children involved in science will make it real and manageable, part of life. Otherwise much science ends up in dusty journals. We need people to live it and understand it. L: I think they should be doing a tiny bit more. They are not really focusing on the problem, not as much as I want them to. You have talked to politicians before, why do you think it is important to talk to scientists also? K: When Lucie was affected by Blue Planet she luckily had me and her dad to help her. But other children will have their passion stopped unless they have an adult who supports them. Some schools don’t do environmental education, it is not within many curriculums, and some parents might not carry on informing their children. There is amazing science going on and some scientists who communicate get through to the children. There is a youth rising at the moment. Children are interested, they want to know and they want to be involved. But, how? Scientists have to continue feeding the information to the children and involve them in citizen science so they will carry on with that passion. L: Inform other people, go on litter picks and map the areas where they found the litter to help prevent more litter. With my friends and my family, we have cleaned three areas so far in my village and we are mapping them to feed in the data about where we found the litter. Also, stop using single-use plastics. Is there any other documentary, book or podcast you would recommend to people who want to learn about plastic pollution in the oceans? L: Drowning in Plastic. We have watched about three quarters of that. K: You are enjoying that, aren’t you? L: Yes… Well, I wouldn’t say we are enjoying it. Thousands of scientists gather in Vienna every year to network and to present and discuss their research at the Austria Center Vienna (ACV). 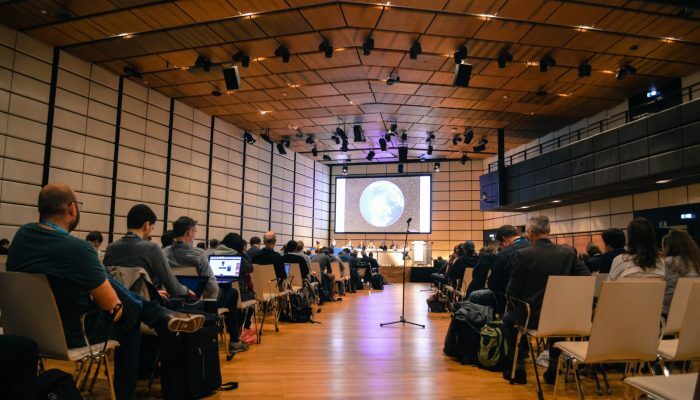 Aside from a packed and diverse programme for scientists at the meeting, the EGU also organises events aimed at the local Viennese public, as well as a few public engagement events and sessions for scientists at the ACV. Since 2018, the EGU organises a public lecture at the Vienna Natural History Museum for the wider public in Vienna. The EGU Public Lecture provides insight into a topic in the Earth, planetary and space sciences of interest to a broad audience, aiming to bridge the gap between the scientists at the Austria Center Vienna and the local Viennese community. female German astronaut in space. 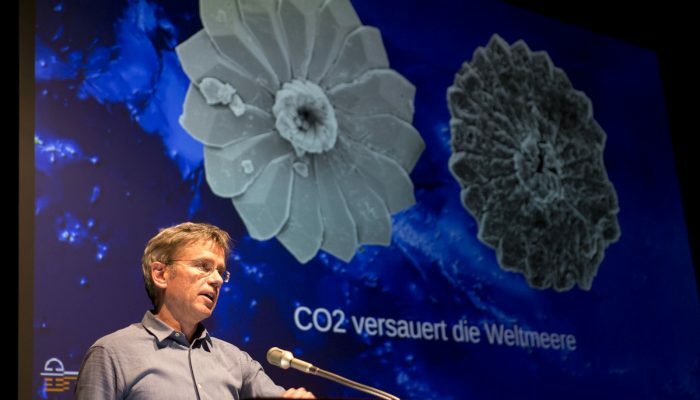 Her lecture for the Viennesse public (in German) is titled ‘Vom Alltag zwischen Atmosphäre und Orbit – ein Bericht‘ and will take place on 11 April. For more information about the EGU Public Lectures, please contact the EGU Media and Communications Manager at media[at]egu.eu. If you are a member of the Viennese public interested in attending the lecture, free of charge, you can sign up to attend on the Museum website. If you are a scientist, feel free to spread the word to anyone you might know in Vienna who could be interested. This year, for the first time, the EGU is also organising an activity targeted at school students in Vienna. The event at the Vienna International School will teach the students (grades 10 and 11) about how 3D virtual reality can be used to explore Italy’s active volcanoes and other geological landscapes. “We want to interact more with local communities and bring the work of the EGU geoscientists closer to the school children of Vienna,” says Giuliana Panieri one of the members of the EGU Outreach Committee. She, together with committee member Mathew Stiller-Reeve, are charge of organising the school event. Each year the EGU awards grants to one or two special public engagement activities so they can continue their outreach to different audiences outside research. 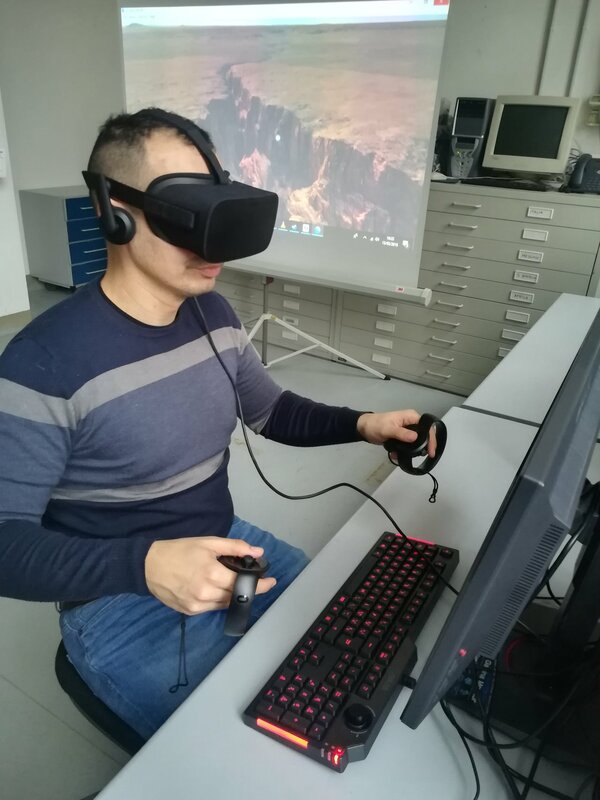 In 2018, one of the grants was won by Fabio Luca Bonali and his team to further develop virtual reality tools to help engage high-school and first-year university students with motor disabilities with the Earth sciences. Fabio is a post-doc researcher at the Department of Earth and Environmental Sciences (DISAT) at the University of Milano-Bicocca who co-founded the outreach organisation GeoSocial Science & Media. During the EGU General assembly, Fabio and members of the EGU Outreach Committee will visit the International School in Vienna to tell them more about Fabio’s fabulous work. 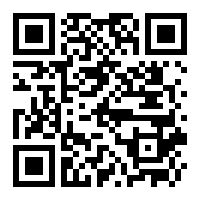 The event (in English) is taking place at the Vienna International School on Tuesday 9 April. EGU will use the feedback from the activity to explore new possibilities to expand these events to other schools in Vienna. “We will continue to offer the opportunity to the public engagement grant winners to connect them with schools to communicate their passion to the next generation of scientists and leaders,” says Mathew Stiller-Reeve. EGU is testing out this concept in English this year. However, if you are a teacher at a German-speaking school in Vienna and would like to connect with this initiative in the future then please get in touch with Mathew (mast[at]norceresearch.no) and Giuliana (giuliana.panieri[at]uit.no). Aside from the public engagement activities for the local public, the EGU meeting will also feature a number of outreach and education sessions at the meeting. Scientists interested in doing more public engagement work, should check the sessions in the Educational and Outreach Sessions and Short Courses programme groups. We would also recommend checking the list of sessions, selected by EGU communications staff, that are of interest to those involved or wanting to be involved in science communication, outreach and education. 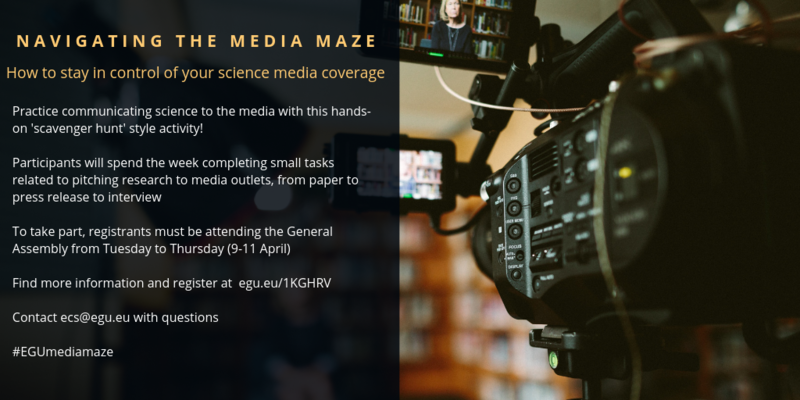 Additionally, this year at the General Assembly, the EGU early career scientist (ECS) representatives are organising a scavenger hunt-style activity, Navigating the media maze, aimed to give participants a fun and interactive experience in engaging with the media about research. The activity is comprised of three stages involving small tasks and meet-up with volunteers around the conference centre. “We understand that the General Assembly is full of scientific sessions, short courses, networking and catching up with friends and colleagues. Which is why we made the Media Maze engaging, fun and it won’t take too much of your time,” said Stephanie Zihms, the Union-level ECS rep and on of the organisers of the activity. If you are interested in taking part in the initiative, you can find more information on the event and how to register through this form. Deadline is 2 April. Photo: Awesome trip above the Earth. Credit: Diana Bejan (distributed via imaggeo.egu.eu). This photo was taken from the International Space Station (ISS), approx. 400 km above the Earth, in the NASA-led educational project Sally Ride EarthKAM (www.earthkam.org), Mission 58, April 2017. The image was requested by a team of 10th and 11th grade students from the National College of Computer Science, Piatra-Neamț, Romania, coordinated by me. The lenses used on the digital camera mounted on the ISS are 50 mm focal length. The area photographed is a region of 185.87 km wide and approx. 123.5 km long, from Utah, USA. The view is spectacular, a perfect equilibrium between mountains, canyons, lakes and bays. It’s just one of the pictures that my students had the opportunity to get from the ISS. Even though we weren’t there on the ISS to trigger the camera, all the locations in which the photographs were taken were chosen by us, on the track of the ISS. The project activities were very complex. The students learned about the Earth, its rotation and gravity, and about the space station and its orbit. They completed their knowledge of physics, understanding how from the ISS orbit we can have another perspective of the Earth. They chose the places on the Earth to be photographed, studied these regions and monitored the weather conditions for better photo opportunities. 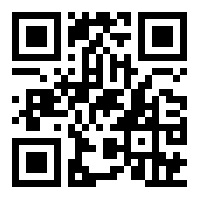 They identified the places on Google Earth, analysed the photos and then created QR codes for some of them. The photo was integrated into a photo exhibition called “The Earth’s Colors” that I realised with my students at my college, which led the viewer on a global trip, discovering how beautiful and fascinating the Earth viewed from Space is. 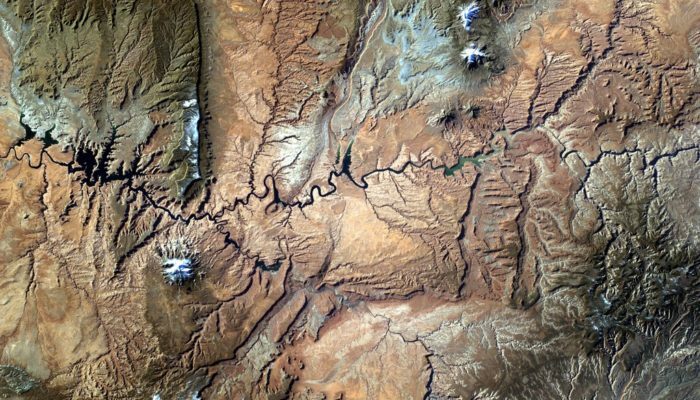 Satellite photography offered my students a new world perspective, encouraging them to ask questions and to search for the answers. It was a new and exciting way to travel and discover our planet.